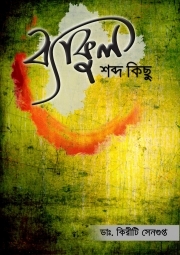 Description of "Byakul Shabdo Kichhu"
Experimentation with poetic form of Language (Bengali), carries additional inputs from four co-authors. Preface written by Arun Chakraborty, Director, Bahirbanga Foundation, New Delhi. A professionally qualified Dental Surgeon, into freelance journalism for years. A talented article writer. Reviews of "Byakul Shabdo Kichhu"